After yesterday’s pre-show antics, I feel I must add another definition to my last post. 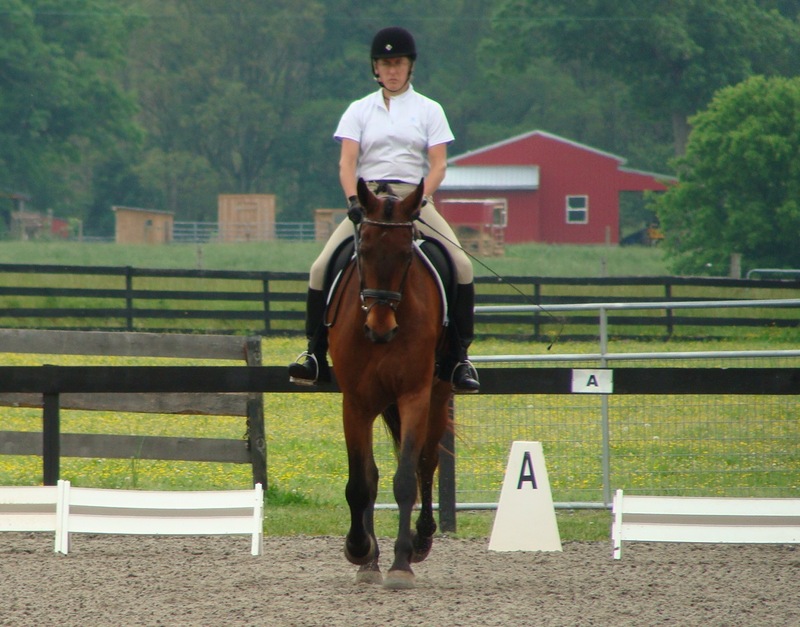 Definition #5 – An involuntary spasm of a muscle when one’s horse acts like a fool. So Sunday dawned with clouds in the sky and a drizzly rain falling – fingers were crossed that we’d have no heavy rain showers. We headed out to the barn to put the finishing touches on Ike’s braids and to get the trailer hooked to the truck. Ike was peacefully grazing when we arrived and decided that grazing would be his chosen activity for the day. When I went to retrieve him for grooming, he decided to be the gingerbread man, as in “Run, run, as fast as you can! You can’t catch me, I’m the Gingerbread Man!! !” Aaarggghhh! Really Ike?! He trotted, and pranced, and galloped and bucked, and almost ran into the fence as he came to a sliding stop. The bucket of grain was not even tempting enough to stop the silliness. Ms. C finally caught the stinker with an armful of fresh cut hay. As if running wasn’t enough, he had also practiced his Stop, Drop, and Roll technique to plaster mud on the left side of his body. Cool. The best I could do was smear it around and wait for it to dry. I could feel my neck muscles beginning to tighten and threaten to throb and tick. Deep breath. The day will get better. We received a 65% and fourth place. Now I need to spend some time comparing the video to my score sheet, but even without that analysis, I can see the difference in the 7 trot and the 6ish trot. Not quite sure what caused Ike to scoot down the long side after the right lead canter transition, but luckily we recovered soon enough to attempt our circle. Judge wants more half halts (surprise) – I want Ike to listen to more of my half halts. Our Training 3 test was not as stellar. Our canter work was FAST! Marmaduke decided to pop out for a romp. Not sure what changed, but such is life. Still trying to find that magic formula where the stars and planets align and all our work is solid. Right now we just have bits and pieces of good in each test, but not everything at one time. Came home with a 62%…the 70% mark seems like it will never come to fruition. Patience, grasshopper, patience. Really enjoyed the vid. Like your picture – very nice.